Efficient delivery of trials to time and target is essential for the UK to retain and enhance its reputations in early phase clinical research. Currently there is a lack of consistency in the way clinical cancer studies are approved and set up, leading the significant delays in trial delivery. 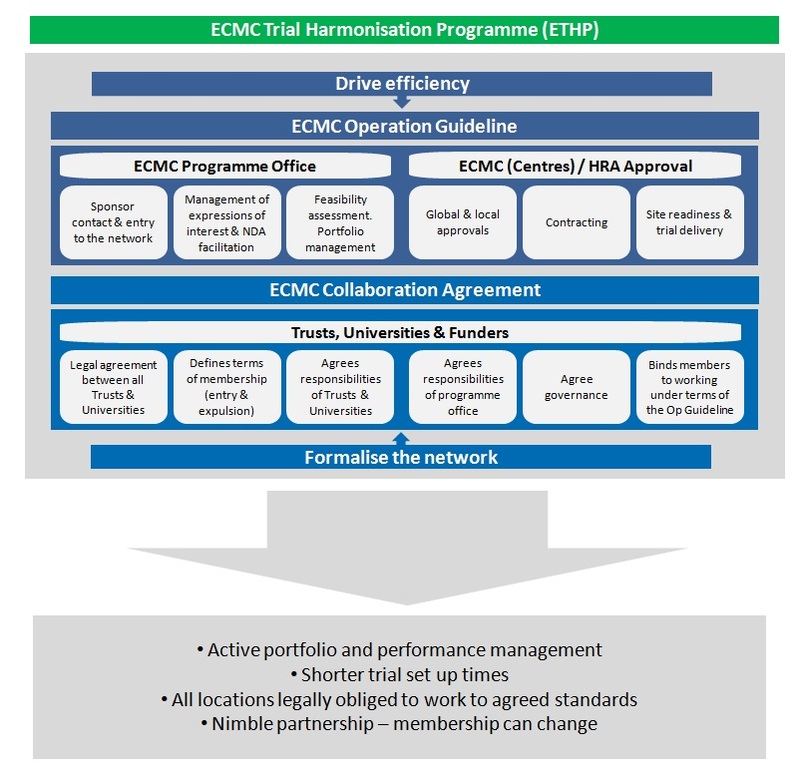 The ECMC Trial Harmonisation Programme (ETHP) aims to help build on the current ECMC initiative and transform it into a UK-wide, world-class Network for the fast and efficient delivery of early phase oncology clinical trials. The research infrastructure of the ECMC initiative makes it ideally placed to harmonise this process and transform the way UK-wide early phase cancer trials are managed across the Network. The development of Operational Guidelines will establish and underpin the operational framework, setting out the agreed trial management processes to which each ECMC Location should adhere. This will be followed by the Collaboration Agreement which will formalise the Network by binding all ECMC member organisations to working under the terms of the Guidelines. One of the first output relating to the Guidelines is an agreed ECMC Non-Disclosure Agreement (NDA) template to help speed up the process of discussions across the network with a commercial partner. The NDA is a UK-wide compatible template to be used on a per study basis (commercial or non-commercial studies). We plan to trial the template from autumn/winter 2015. All potential commercial partners wishing to use the ECMC NDA, please refer to our industry pages or contact our Programme Manager, Nicholas Wong. The first joint ECMC/Health Research Authority (HRA) R&D improvement initiative is the creation of a single technical pharmacy review. The project aims to streamline pharmacy reviews during trial set up, reducing set up times by centrally reviewing the technical pharmacy aspects of new studies on behalf of all participating centres. This will remove duplication and administrative bottlenecks. The project will be rolled out for all early phase clinical cancer trials of investigational medicinal products that are delivered within the ECMC Network. Pharmacy Assurance will form a component of HRA Approval when Cohort 4 is rolled out in Winter 2015. The ECMCs, through the STPR, have been involved from the start as part of the first phase of implementation for HRA Approval. The first phase has recently been evaluated and further announcements through the HRA will be made in due course regarding further implementation – the evaluation report is available here. Prior to HRA Approval national roll-out, the HRA will still continue to support the ECMCs as part of the Pharmacy Assurance process. The HRA process coordinates one technical pharmacy review for each study, which on completion provides an assurance to all the study sites. Study sites will then only be required to assess local capacity and capability to ensure that the study is deliverable locally. This reduces duplication in pharmacy review of new studies, as well as contributing to improved study set up times. From implementation in September 2014 to the end of the initial period in April 2015, 38 reviews were completed by the Designated Pharmacy Reviewers, who are all pharmacy staff from the ECMCs, which saved 170 duplicated reviews at ECMC sites alone. Data analysis and quality assurance information will inform the phased implementation of the Pharmacy Assurance in a controlled way, ultimately extending the process to all study types requiring this type of review. For all studies the use of the materials and guidance on site set-up developed by the NIHR Clinical Research Network is strongly encouraged. Further details relating to the HRA can be accessed here. Applicants are recommended to contact the HRA as soon as the pharmacy documentation relating to the trial is fixed so that maximum benefit is gained when setting up sites. For more information about the process or to submit a study that meets the above criteria please email the Technical Assurances Officers. As with the Pharmacy work, assurances around Medical Exposure to Ionising Radiation will also form a component of HRA Approval. Within the same partnership agreement with the HRA, we are developing a streamlined process which will remove duplication from sites, freeing researcher, Clinical Radiation Expert (CRE), Medical Physics Expert (MPE) and clinician time whilst maintaining an acceptable level of assurance within the regulatory framework. Once this has been tested with the ECMCs, data analysis will inform a phased roll-out to all studies requiring these reviews in late 2015 in alignment with the roll-out of HRA Approval. The underpinning principles of the process for medical exposure reviews were agreed in September 2014, following the preliminary work of the HRA Collaboration and Development team. Initial testing started in January 2015 and has completed in October 2015. The evaluation report can be found here. Applicants are recommended contact the HRA as soon as the radiation aspects of the trial are fixed so that additional trial details can be finalised whilst the radiation review is ongoing and to reduce the potential for delays to occur pre-submission to REC. The process will be co-ordinated by the HRA from submission through to the completion of the Lead CRE and MPE reviews which are required in Integrated Research Application System (IRAS). For more information about the process and submission requirements can be sought by emailing the Technical Assurances Officers. We’re delighted that our ECMC Network is continuing to help cancer patients around the country benefit from world-leading research taking place here in the UK. This initiative will ultimately help potentially life-saving drugs reach cancer patients sooner by accelerating the first step of clinical research.